It’s the season of warm weather and pool fun at multifamily apartment complexes. Swimming pools are a summer necessity for beating the heat, but they can be a huge safety concern. According to the CDC , drowning is the number one cause of death for children under the age of four. Also, the U.S. Consumer Product Safety Commission reports that about 5,000 people every year receive emergency care because of injuries suffered in swimming pools or spas. Those statistics are reason enough for multifamily apartment complexes to administer proper pool safety. Apartment Guide published a blog outlining ways residents can help increase pool safety. First and foremost, awareness and communication are key. The author encourages adults to learn CPR, as well as familiarize themselves with the rules of the pool area and share them with children and guests. Once at the pool, adults should stay close to children, even if the child is a good swimmer or wearing a floatation device. No one should ever run around a pool. Wet areas can be slick and cause people to fall. Most importantly, always heed ‘No Diving’ signs. They are there for a reason. To avoid liability issues, property managers also need to exercise proper pool safety. This includes addressing health and safety hazards, like chlorine levels. If there is a negative shift in chlorine, or if there is a malfunctioning filtration system, algae and other organisms can turn the water green. If property managers do not address this problem immediately, a resident could get sick. To remedy a green pool, drain, clean and refill it before anyone gets back in. To help protect yourself from a premises liability suit, be sure to post a sign at the pool notifying residents and guests about any possible risks. If someone does become injured, it is often difficult to prove who is at fault. It can be your word against theirs. However, by working with a video surveillance company, you can help prove you took reasonable care to deter potentially dangerous activity. In addition to providing video evidence of an incident, trained security operators can watch common areas like parking lots, mail rooms and swimming pools to real time. If they see anything out of the ordinary, they can activate a speaker warning and call a security guard or local police. 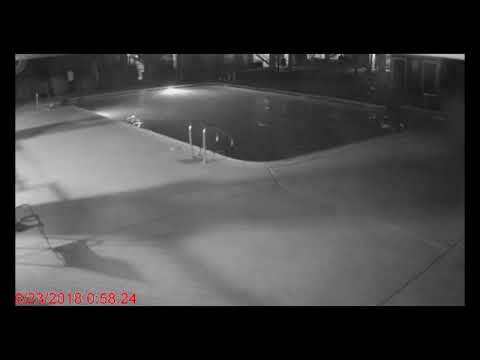 Click the video bellow to see how our night vision security camera systems in action. Pool safety is important, especially in the summer months. It’s up to the residents and property managers to take adequate precautions to help ensure a fun and safe time. If you would like to speak to an apartment security specialist for additional information, click here.